Dubbings There are 5 products. 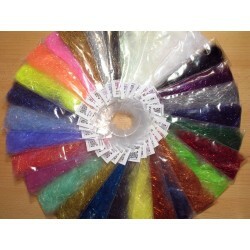 Hand-made dubbing blend for the Czech nymphs in 20 popular colors. It consists of rabbit, fine antron, hare and fine pearlescent fibers. 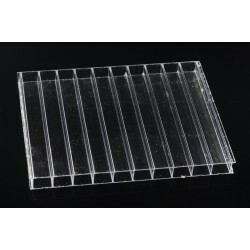 Handy clear box for your dubbings. 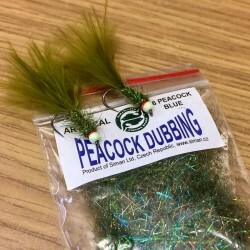 Fine version of our popular Peacock Dubbing. This is great substitution of natural peacock herl for tying small flies. Available in 10 colors: 01 Peacock Green, 02 Peacock Bronze, 03 Peacock Eye, 04 Peacock Black, 05 Peacock Red, 06 Peacock Blue, 07 Peacock UV Green, 08 Peacock UV Black, 09 Peacock UV Bronze, 10 Peacock Reddish. Angelina Hair is very fine mylar type material. With 6-8 inch strands Angelina Hair can be formed into hanks and used for big streamers or cut for dubbing your small trout flies.